The HDMI over HDMI and CAT5e/6/7 Splitter can split and distribute a single HDMI input, 2-way IR control and LAN serving to up to three CAT5e/6/7 outputs and includes a simultaneous HDMI bypass output. It supports resolutions up to 1080p Full HD, 4K×2K timing, 3D and multichannel digital audio formats (such as LPCM 7.1CH, Dolby TrueHD, Dolby Digital Plus and DTS-HD). The HDMI bypass output can be connected to an HDMI display or cascaded to another splitter. 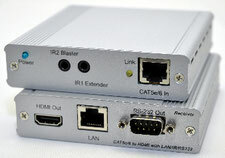 The three CAT5e/6/7 outputs can be connected to CAT5e/6/7 to HDMI receivers to extend the operating distance up to 100 meters. Additionally, the LAN connectivity will allow a 100BaseT network to be served to smart TVs or games consoles. 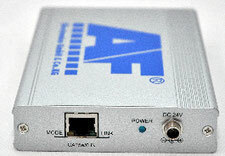 The Power over Ethernet (PoE) function can power compatible receivers, providing greater flexibility in installations. The HDMI over HDMI CAT5e/6/7 Splitter can split and distribute a single HDMI input, 2-way IR control and LAN serving to up to seven CAT5e/6/7 outputs and includes a simultaneous HDMI bypass output. It supports resolutions up to 1080p Full HD, 4K×2K timing, 3D and multichannel digital audio formats (such as LPCM 7.1CH, Dolby TrueHD, Dolby Digital Plus and DTS-HD). The HDMI bypass output can be connected to an HDMI display or cascaded to another splitter. The CAT5e/6/7 outputs can be connected to CAT5e/6/7 to HDMI receivers to extend the operating distance up to 100 meters. Additionally, the LAN connectivity will allow a 100BaseT network to be served to smart TVs or games consoles. The Power over Ethernet (PoE) function can power compatible receivers, providing greater flexibility in installations. The HDBaseT™ Repeater allows HDBaseT systems to be extended and cascaded. The model supports the highest quality of uncompressed high-definition HD video up to 4K×2K (Ultra HD), up to 8 channels of uncompressed multi-channel audio, RS-232 and IR control systems, PoE and Ethernet, complete HDBaseT 5Play™ convergence with just a simple connection over a single CAT5e/6/7 cable. 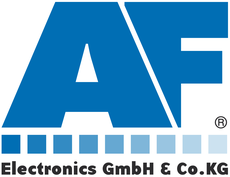 The AF-HBR02 HDBaseT RX allows uncompressed HDMI™ signals and IP data to be transmitted over a single CAT5e/6/7 cable. This solution has the added features of built-in RS-232, 2-way IR control and Power over Ethernet all over the single CAT5e/6/7 cable. These combined HDMI and control signals can be transmitted up to lengths of 100 meters.